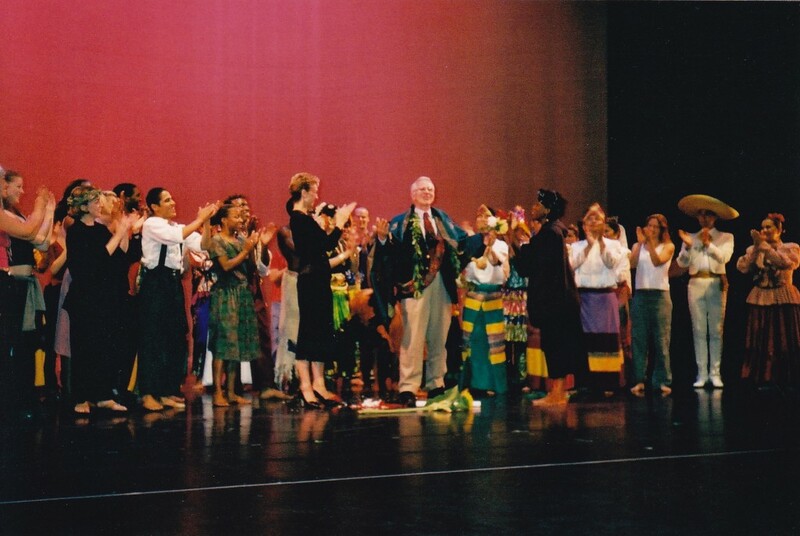 The following video was shown at the Dance Kaleidoscope Final Tribute Performance (Don Hewitt) at the Japan America Theatre – July 21, 2001. Video Artist: Arian Ravarour; Lighting: Eileen Cooley, Don Bondi; Program Coordinator: Lee werbel, Gail Matsui; Voice Over: Gary Bates, Eileen Cooley. Photo: Artists presentation to Don Hewitt (center), Producing Artistic Director 13 years. Participating artists shown: Kayamanan Ng Lahi-Joel Jacinto, Victoria Koenig, Jazz Tap Ensemble, Danzas Floricanto/USA, TONGUE, Shei Wagner Rasch and Stephanie Nugent, Matthew Rushing (Alvin Ailey Co.), Ramaa & Swetha Bharadvaj, Loretta Livingston, Lula Washington with LWDC Dance Theatre.